The curvilinear ornamental branch-like shapes of stone or wood, creating an openwork pattern of mullions; so treated as to be ornamental; found within the upper part of a Gothic window or opening of similar character. Any tracery that is not pierced through. A form of Gothic tracery in Germany in the late 15th and early 16th century made to imitate rustic work with boughs and knots. A tracery on the soffit of a vault whose ribs radiate like the ribs of a fan. Gothic tracery characterized by a pattern of geometric shapes, as circles and foils. Any tracery formed by the upward curving, forking and continuation of the mullions, springing from alternate mullions or from every third mullion and intersecting each other. Gothic style window tracery in sections within a large opening. Tracery of the Perpendicular style with repeated perpendicular mullions, crossed at intervals by horizontal transoms, producing repeated vertical rectangles which often rise to the full curve of the arch. Tracery whose openings are pierced through thin slabs of stone. Gothic tracery consisting mainly of a net-like arrangement of repeated geometrical figures. 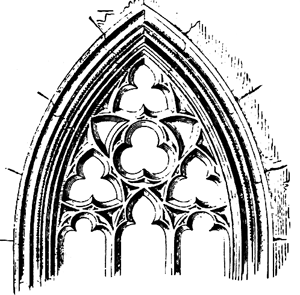 The curvilinear openwork shapes of stone or wood creating a pattern within the upper part of a Gothic window, or an opening of similar character, in the form of mullions which are usually so treated as to be ornamental. By extension, similar patterns applied to walls or panels. See bar tracery, branch tracery, fan tracery, etc. Archit a pattern of interlacing ribs, esp as used in the upper part of a Gothic window, etc. As for the gable tracery, for a later, more sensitive Surveyor, William Lethaby, this was 'probably the most remarkable example of early tracery in England'. Astronomers had expected airborne equipment to reveal more delicate tracery in the corona than is seen from the ground. Black ringlets escaped the twisted silver of her headdress, and as she came nearer Nick could see the delicate tracery of veins mapping breast and wrist. Even when Forg introduces overlays of color, as well as monochromatic bricks topped with linear tracery, the paintings fail to recede into illusionistic space. 1,2) Biopsy of the duodenal bulb and second portion, the duodenal mucosa showed alteration of its architecture, with marked enlargement of the villi due to the accumulation of histiocytes with eosinophilic and tracery cytoplasm in the chorion, (Figs. The unglazed edge they sit on becomes in the finished piece a solo tracery in its own right despite being an inseparable part of the whole. The sun was going down in bands of burnt orange and purple with the stark black tracery of the bare trees silhouetted against the sky. Patterns include ribbon candy stripes, large florals, trellis fabrics, China Seas and tracery patterns. Warping is visible in the tracery, accommodating differences in the masonry shell as it takes up the inconsistencies of bay dimensions. The carved head of the stick depicts St Cuthbert, a Celtic cross, tracery from the Lindisfarne Gospels and early Greek symbols of Christianity, made from a single sheep horn with a stripped chestnut shank. They rise in smoke above the burning city, Faint clouds, dissolving into sky - And who sifting the Libyan sand can find The tracery of a human hand, The faint impression of an absent mind, The fade-out of a soldier's day dream? Instead, a wall and bits of tracery describe a shallow niche, as if this is a grouping of statues in a church.